Shortly after President Barack Obama won re-election last month, NewsOnecompiled the often ridiculous — and always dramatic — reactions of Republicans. Now you can add Glenn Beck‘s name to that list, after he announced this week that his New Year’s resolution involved firing anyone who mentioned the President’s name on his show. 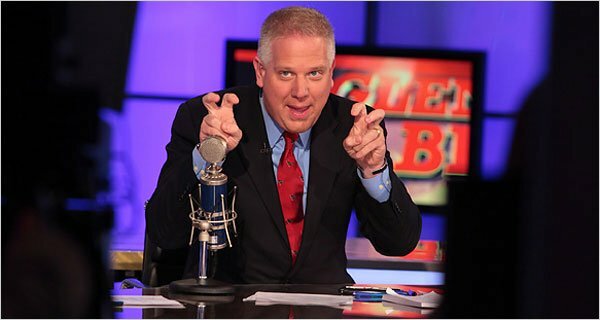 To which Beck responded that he would evaluate statements on a “case-by-case basis.” Beck then informed his colleagues that audio of Obama’s voice was also barred, with Burguiere saying, “Now we can’t play his audio…but I think we have to say [the President’s name]. You can allude to him. You can play Joe Biden. But I don’t want to hear the man’s voice. I don’t want to hear him. I don’t want to know about him. You want that information? Go any place else. There’s thousands of outlets; you can have all the information you want. I am not talking about that man. But Beck refused to back down. Burguiere: “I don’t know how long you can last [not saying the President’s name.] … What about the idea of a caller asking [about Obama]? While some may find Beck’s behavior to be comical — among other things — Beck’s latest “bright idea,” strikes me as particularly insulting. After all, it isn’t as if Beck is talking about some dubious Tea Partier or even debating the culpability of once-secretary-of-state hopeful Susan Rice. To tell his colleagues, who clearly don’t agree with his antics, that they should consider the president’s name a “swear word” that should not ever be uttered on his show again is both disrespectful and absurd. When the infamous George W. Bush lied about weapons of mass destruction, where was Beck then? Did he ban former-President Bush’s name from his show? Here’s one better, both parties have repeatedly admitted that Bush’s presidency was a “failure.” Still, when Iraqi journalist Muntadahar al-Zaidi threw his shoes at the then-President (watch below) and called him a “dog” for crimes against his people, there was an outcry that as president, Bush still deserved respect. I find it thoroughly amazing at the lack of respect shown to our president. I am an independent and would respect any president, regardless of party affiliation. It is also so ironic that the very people who claim to be the most “tolerant and peace loving” individuals are the most vicious. I am a Democrat but I still believe in respect for the Office of the President and for the President. We may not agree with him and thank God we live in a nation where we can voice our opinion. When you do, do it with respect. I think I am more angry at the Secret Service, where the hell were they and what were they thinking?? If it had been a bomb, a pie, or a bullet the President would have been hit while they were dreaming. Please, remember we are Americans, and we should show respect before we can demand it. Some of the opinions stated here are terrible. I hope more respect will be shown in the future for the next President. Whether you agree with his policies or not, the treatment the President has had to endure since moving in to 1600 Pennsylvania Ave. is almost unspeakable. Once again, Republican’s over-the-top reactions to Obama drive home the point that their collective rejection of the President has nothing to do with his actual policy. For if it did, both Democrats and Republicans would have stopped saying former President Bush’s name on radio and TV stations across the country back in 2004. Instead, what we are dealing with here — and have been dealing with since 2008 — is the unadulterated racist belief that none other than a White male can lead this country. But as the November election proved, their time dominating this country with their biases and glass ceilings is over. In fact, in due time, the Becks of the world won’t have enough viewers to sustain themselves, so they better get their foolishness in while they can.